After their Women's FA Cup exploits against Arsenal recently, Crawley Wasps return to action tonight (Wednesday) as they continue their bid for back-to-back promotions. Wasps - watched by 1,550 people as they went toe-to-toe with the fully-professional Gunners in a 4-0 defeat - travel to AFC Wimbledon, who play at Carshalton's Colston Avenue ground (kick off 7.45pm). And although they did not kick a ball on Sunday, Paul Walker's side received a boost to their title ambitions when nearest rivals Billericay were held to a 2-2 draw by Enfield. 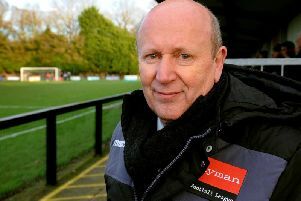 It means they are now four points ahead of the Essex team with two games in hand, and need a maximum of nine wins from their final 12 matches to be promoted to the FA Women's National League Southern Premier Division. Wimbledon are in mid-table, having lost their last two league games, but like Wasps they also gave a Women's Super League team a decent workout in the cup, losing 3-0 to Bristol City. Dons' dangerwoman is striker Caroline Bisson, whose 12 goals in 20 games in all competitions includes one against Wasps in a 5-2 defeat at Oakwood in September. Last weekend, the only Wasps team whose game beat the weather was the Ladies thirds. They found themselves 3-0 down after half an hour at AFC Littlehampton in the Sussex Women's League Cup, but fought back with goals from Toni Smith, Abbie Crawley and Chanelle Gainsford. That forced extra-time but the hosts snatched a winner from a goalmouth scramble.